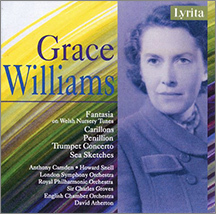 Grace Williams was one of the first professional Welsh composers of the twentieth-century to attain significant national recognition, and many of her remarkably distinctive pieces are directly inspired by Wales and its culture. Born in Barry, Glamorganshire, Williams studied music at Cardiff University (1923–26), later studying composition at the Royal College of Music (1926–30) with Ralph Vaughan Williams and in Vienna (1930–31) with Egon Wellesz. 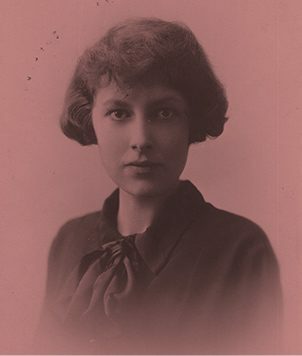 She particularly enjoyed writing for the orchestra, and her gift for this medium is apparent in her early overture Hen Walia (1930) and the Fantasia on Welsh Nursery Tunes (1940). She followed her popular Fantasia with a Sinfoni a Concertante for piano and orchestra (1941), and a dramatic First Symphony (1943), a work inspired by the fifteenth century Welsh rebel Owain Glyndwr. Her masterly Sea Sketches for string orchestra (1944) were stimulated by her beloved Glamorganshire coast. Williams worked as a successful composer and music teacher in London for many years, but returned to live and work in Barry in 1947. This homecoming sparked a new and vital phase of her creative development. 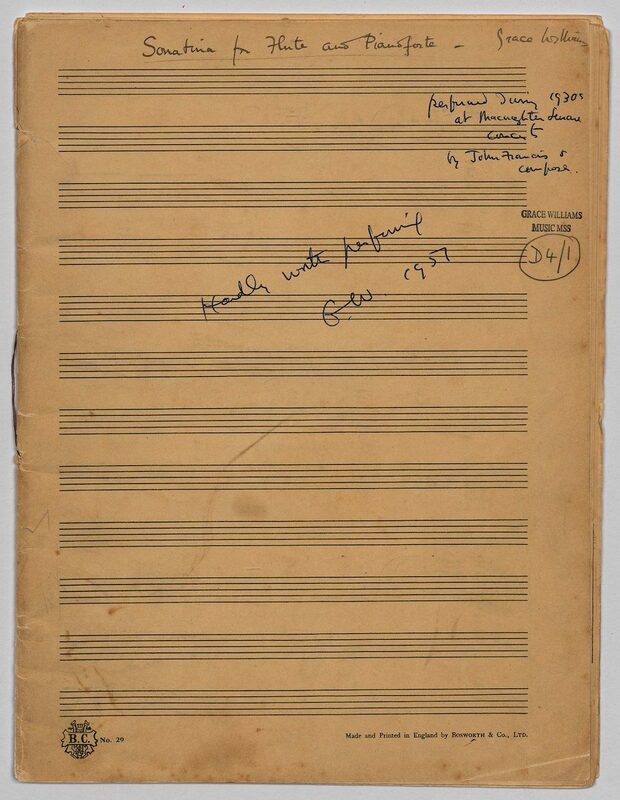 Her Penillion for orchestra (1955), for example, is a highly original orchestral adaptation of the metrical and melodic characteristics of traditional Welsh penillion singing. 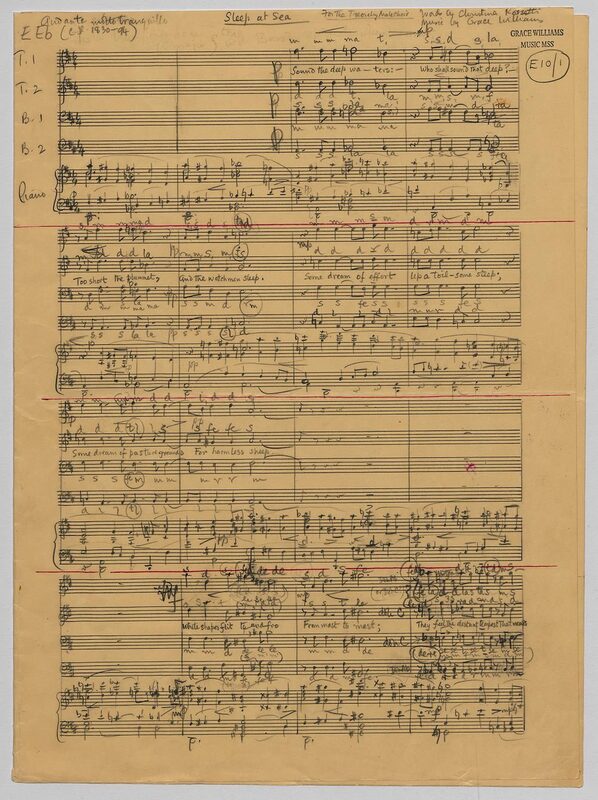 Her expanded musical vocabulary energised other significant works for orchestra including the powerful Symphony no. 2 (1956), the Trumpet Concerto (1963) and Ballads for orchestra (1968). Williams also became more interested in writing more choral and vocal music in her later years. Her choral suite The Dancers (1951) is a radiant example of her skill at handling the choral medium, as is the exquisite Ave Maris Stella (1973) for mixed chorus. Many of her greatest large-scale works for voices date also from this time including her brilliant comic opera The Parlour (1966), the Missa Cambrensis for soli, chorus and orchestra (1971) and the exquisite aria Fairest of Stars (1973) for soprano and orchestra. 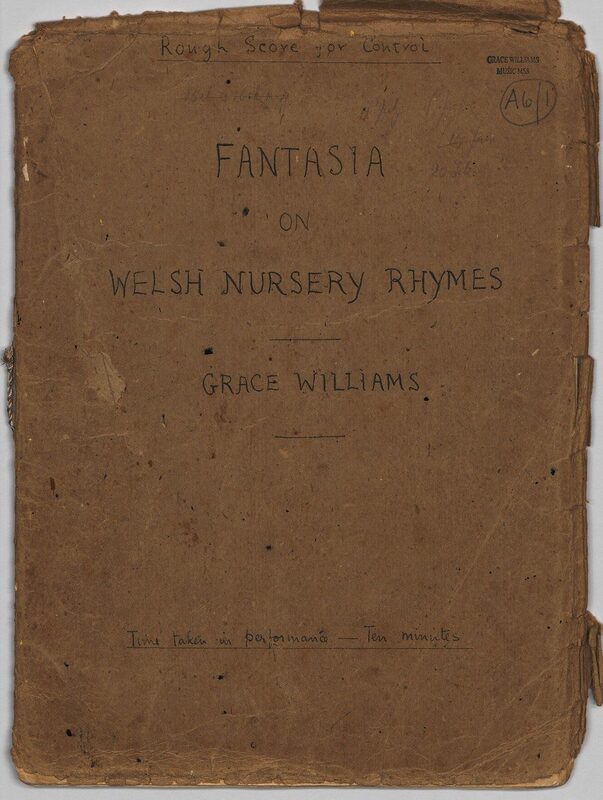 Grace Williams's manuscripts are held at the National Library of Wales. Please visit the database of their collection here. Mae llawysgrifau Grace Williams o fewn casgliad Llyfrgell Genedlaethol Cymru. Ewch i chwilio'u bas data yma. This outstanding setting for mixed choir was commissioned by the North Wales Music Festival in 1973. Ave Maris Stella is one of the best known medieval Latin hymns in praise of the Virgin Mary and Grace Williams uses the first line (Ave Maris Stella – Hail, star of the sea) as an invocation before each of the 7 verses. The rhythms and melodic lines of the music reflect the ebb and flow of the sea, imagery which exhibits the composer’s life-long fascination with the sea in all its moods. 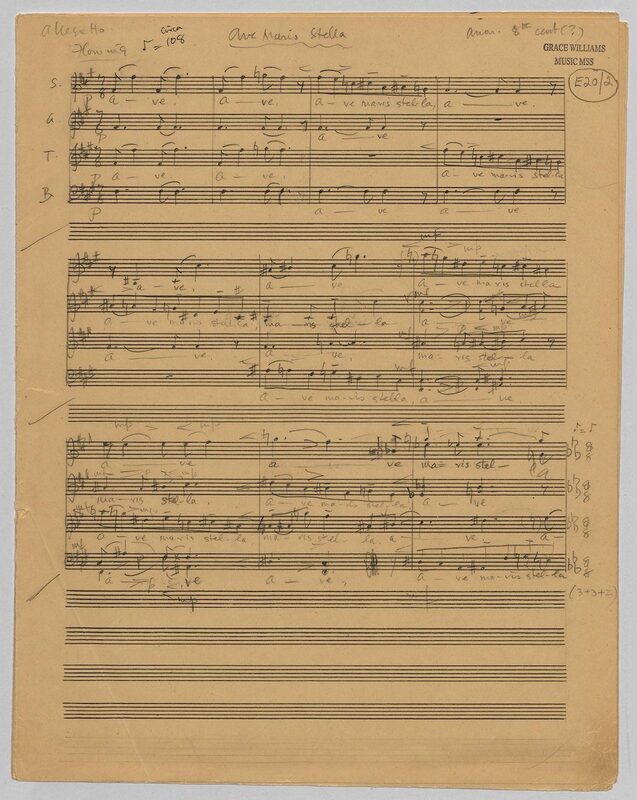 This orchestral work remains one of the composer’s most popular works. From the outset where the muted trumpet quotes the children’s song “Dacw Mam yn dwad ar ben y Gamfa Wen” (often confused for Yankee Doodle Dandy by American listeners) this 11-minute work presents a skilful and beautiful arrangement of several traditional songs. Grace Williams keeps the liveliest tunes for the beginning and end, framing a middle section of slower more wistful music in contrast. It was a great hit when it was first performed in 1940 and has remained popular with successive generations of professional and youth musicians. This substantial work for choir and piano lasting just under 9 minutes was written for the famous Treorchy Male Choir. The words are by Christina Rossetti who is probably best remembered for writing the Christmas carol“In the Bleak Mid-winter”. Sleep at Sea is a typically sensuous setting by the composer in 4 voice parts with some subdivisions. The imagery of the sea’s ebbing and flowing are ever present in the undulating piano part and in the shifting, but always, logical harmonies. This Sonatina is one of a number of instrumental works with piano or for small ensemble which Grace Williams, then in her twenties, wrote in the ten years before the Second World War. The music dates from 1931 when she had just returned from Vienna where a scholarship had allowed her to study with Egon Wellesz. 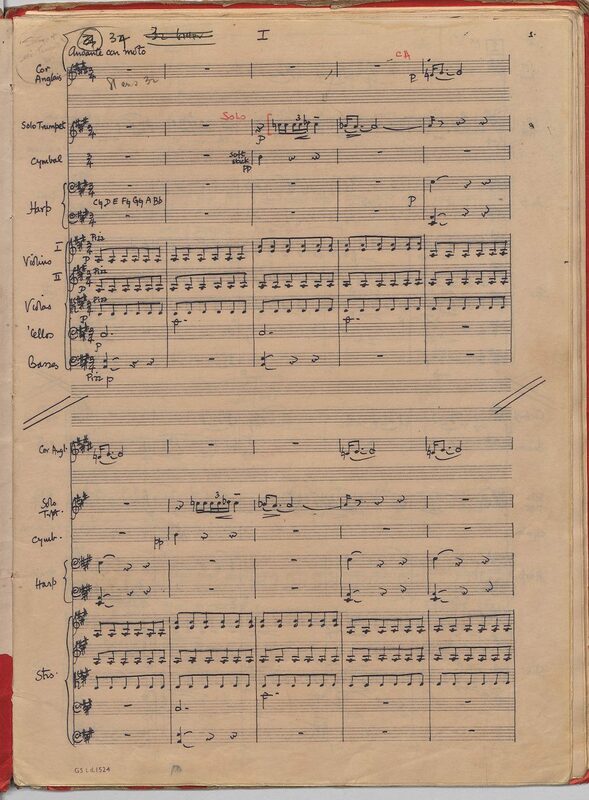 Grace Williams had previously taken composition lessons with Ralph Vaughan Williams at the Royal College of Music in London and it is not fanciful to note that it is her former teacher’s influence which can be heard more keenly in this work which is composed in three movements. You can listen to a recording of the Sonatina here, with Sarah Newbold (flute) and Zoe Smith (piano). This fine work was written in 1963 for Bram Gay who was then principal trumpet with the Halle in Manchester. The Concerto received many public and television performances, promoted by Gay and enthusiastically taken up by conductors Sir Adrian Boult and Sir Charles Mackerras. It has three movements and represents a culminating moment for the composer in her lifelong interest in the lyrical and expressive qualities of the solo instrument. The Concerto is shortly to be released on Ty Cerdd Records in a performance given by Phillippe Schartz and BBC National Orchestra of Wales.